GDP of the Shutdown, January 15, 2019. The following is posted, with his permission, from an email by Dana Chasin. WASHINGTON, D.C., January 15, 2019 – Per a report by S&P Global Ratings, the US economy has lost $3.6 billion since the beginning of the shutdown on December 22. Original estimates by President Trump’s chief economist, Kevin Hassett, put the damage to the economy at $1.2 billion each week the shutdown continues. The Trump administration has since doubled its damage estimate to the economy, estimating today that the shutdown results in a GDP loss of $2.4 billion — 0.1 percent off the annual holiday growth rate — each week of the shutdown. The loss in GDP growth results partly from the loss of government work hours and partly from the decline in spending by unpaid federal employees. To the extent they depend on federal contracts, private contractors are also without work during the shutdown, amplifying the effects for the wider economy. Ironically, if the shutdown continues for another two weeks, the amount shaved off US GDP would be equivalent to the amount requested by the president for the border wall. The shutdown comes as doubts are raised about the strength of the US economy. 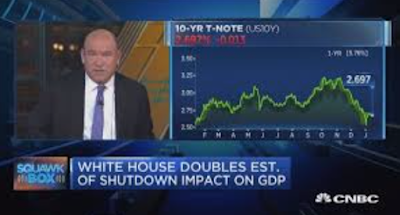 A protracted shutdown is occurring at a time when there are ongoing trade negotiations with China, concerning indicators in the housing and leveraged loans markets, slowing global growth, and concerns over Fed rate hikes and quantitative tightening. While the 800,000 furloughed federal employees are expected to get back pay [the President on January 16 signed a commitment to that effect – https://federalnewsnetwork.com/government-shutdown/2019/01/trump-signs-bill-ensuring-federal-employees-get-paid-after-government-shutdown/ –JTM], many contractors, like janitors and cafeteria staff, typically get no such protection. There is no official source tracking the number of current federal contractors, but Paul Light, a professor at New York University, estimates there are over 4 million contractors and grant recipients affected by the shutdown. In a letter on Thursday, January 10, 34 Democratic Senators implored OMB to grant back pay for low- and middle-income contractor employees. The Senate Appropriations Committee estimates that in addition to the 420,000 federal employees that have to work without pay, 380,000 are furloughed — meaning they are sent home without pay. According to the American Federation of Government Employees, a labor union that represents about 700,000 workers, while some government employees make six-figure salaries, the average weekly salary of a government employee is only about $500. Low- and middle-income workers and families directly affected by the shutdown, some of whom will not end up receiving back-pay, compensate for the lack of paychecks by collecting unemployment, dipping into or draining savings accounts, turning off the heat in their homes, borrowing money from friends or family, or taking out small commercial loans. Some areas of the country are harder hit than others; over the past three weeks, Washington, D.C. saw the highest level of jobless claims in six years. If the shutdown continues much longer, mounting late fees, defaults, evictions, and foreclosures are significant, dangerous, and very real prospects for many federal workers and contractors. The knock-on effects of individuals not participating in the wider economy will also soon become noticeable. Severely limited capacities at the Federal Trade Commission (FTC), Department of Justice (DoJ), and the Securities and Exchange Commission (SEC) are putting initial public offerings (IPOs) and M&As in jeopardy. The SEC is not reviewing IPO filings during the shutdown, threatening prolific upcoming filings such as the ride sharing apps, Lyft and Uber, which were initially slated for early Q1. Once agency employees return to work, they will still face a large backlog that may have ripple effects throughout the year in the capital markets. The US Department of Commerce has not been able to publish a number of regular reports that look at the health of the US economy, including new home sales, factory orders and inventories, construction spending, and trade balances. The US Department of Agriculture has also been unable to publish its monthly World Agricultural Supply and Demand Estimate (WASDE), a vital source of demand, supply, and inventory data for farmers and crop traders. According to HUD, around 1,150 federal rental assistance contracts have expired since the shutdown began and have not been not renewed. Around 150,000 people, mostly seniors and those with disabilities, are covered under this program and without government assistance, may face the risk of eviction. Also at risk is the Supplemental Nutrition Assistance Program (SNAP), run by the USDA. While SNAP is able to operate through February, millions of recipients could have their basic food assistance cut back in March and even removed altogether in April, if the shutdown persists. The SBA has stopped approving new loans on day-one of the shutdown, affecting many small businesses who are looking to expand their operations or get their business off the ground. Small businesses employ 53 percent of the domestic workforce and a protracted shutdown could cause a domino effect as loan growth in this sector stalls. The well of federal money for highway projects has been dry since the shutdown began on Dec. 22. State officials relying on federal funding assistance for their highway and transit initiatives are reluctant to authorize planned projects for 2019. Though states could tweak their financing to operate at near-normal levels in the short-term, a protracted shutdown will affect much-needed highway and transit maintenance and improvements across the country for the rest of the fiscal year. With Democrats standing united in opposition to wall funding, President Trump has few options on the table. The most obvious (but perhaps least likely) solution to the shutdown would be compromise. Democratic leadership has put forward a two-bill proposal to address the situation. The first bill, H.R. 21, would fund all agencies outside of the Department of Homeland Security (DHS) through the fiscal year, while the second, H.J. Res.1, would extend current DHS funding through February 8. The additional month provides a window for ongoing border wall negotiations, allowing the rest of the government to reopen. Both passed the House by a near party-line vote last week. Trump has repeatedly shot down this proposal, claiming he will accept nothing short of the requested $5.7 billion in wall funding upfront. New York Magazine Intelligencer: http://nymag.com/intelligencer/2019/01/the-longer-the-shutdown-lasts-the-more-it-hurts-the-economy.html This story calls all of the unpaid workers "furloughed", not the definition used by GovExec.. It's Official: Furloughed Feds Will Receive Back Pay Once the Shutdown Ends // GovExec Staff. President Trump on Wednesday signed into law a bill that guarantees about 350,000 furloughed federal employees back pay once the partial shutdown ends. This source restricts the term "furloughed" to workers who are told not to come into work, as opposed to those working without pay, who are called "excepted" or "exempted". Letter from Federation of American Scientists on the cost of the shutdown to science: https://mailchi.mp/fas/2019-government-shutdown. Same message as story in NY Times on the impact of the shutdown on scientific research on January 16.